With comprehensive medical care and structured activities, every aspect of the 76-bed dementia care pavilion at Daughters of Miriam Center/The Gallen Institute is designed to care for patients suffering from Alzheimer’s disease and related disorders. A critical component differentiating the Center’s dementia care pavilion from other facilities is the interdisciplinary healthcare team approach. An attending physician is present throughout the day and is available when an emergency or change in a resident's status is noted. Physicians are available to meet with family members during the day and are on-call at night for emergencies. Consultations are available promptly for the evaluation and management of behavioral or neurologic problems with close monitoring of drug therapy. 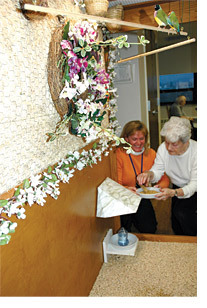 The unit is staffed by nurses and assistants trained and experienced in the management of dementia residents, their behavioral problems, medical complications and the effects of medications. Consulting physicians in most specialties are available. Physical and occupational therapy is available for the management of treatable physical complications. In addition, the dietary staff is instrumental in dealing with feeding and eating problems which occur frequently in dementia. The social worker involves family members in the interdisciplinary meetings where each resident's status is reviewed. The therapies initiated out of these individualized care plans increase feelings of security in residents, reducing incidents of challenging behavior. 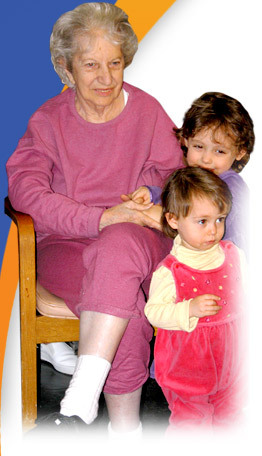 This integrated activity by the staff and families distinguishes a specialized unit from standard nursing care. Recreation therapy is a key component of the dementia care pavilion with the goal towards maintaining residents at their highest level of physical well-being and mental acuity. A structured daily therapeutic program provides independent function and improved quality of life for all participants by reducing confusion, maximizing independence and relieving anxiety in a safe, comfortable way. The daily schedule includes activities of daily living, socialization skills, cognitive and expressive interaction, physical activities, movement therapy, sensory and physical stimulation, behavioral interventions and recreation/leisure activities. According to the Alzheimer’s Association, six out of every ten people with dementia will wander because of their inability to recognize familiar places and faces. 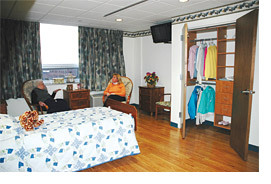 Therefore, a WanderGuard system was installed to allow residents to move about the pavilion safely and independently, yet nurses are able to monitor those residents who are prone to elopement. State-of-the art clinical features have been added to the unit, such as a two-way call system linking the bedside to the nurse’s station. A new bathing system has been installed in the hydrotherapy rooms. Tubs are equipped with a hydromassage unit which gives extra stimulation to residents’ peripheral blood circulation while each unit is self-sanitizing to protect residents from infection. For further information contact the director of admissions by clicking on the link or via telephone at 973-253-5358.